Wendy Quinn, wife of the British High Commissioner to Guyana, Greg Quinn, on Friday lauded the Guyana Baseball League (GBL) for sending a national women’s U21 team to Halifax, Canada, to participate in an invitational tournament from August 4-10. Quinn, in delivering an address during the team’s luncheon at the private residence of Scherazade Khan, expressed her admiration for the efforts of the GBL, saying that the endeavour provides the young athletes with opportunities to broaden their horizons. “When faced with difficult decisions, follow your heart, look inside and you will find the right answer, you will know what is good and right, trust yourself to do the right thing,” she declared. 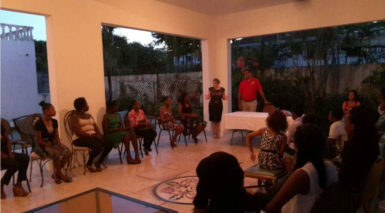 Wendy Quinn speaking with the Guyana Baseball League U21 girls team on Friday evening. The players, all of whom are from Berbice, presented Quinn with a GBL pin as a token of their appreciation. Meanwhile, Director of Sport, Christopher Jones, who was also at the luncheon, encouraged the young ladies to continue their hard work and dedication to the sport. “We have identified female participation in sport as an important component of national growth and in 2015 we asked parliament to approve funding for this area and this was granted,” said Jones who also pledged the support of the National Sports Commission in ensuring a successful tour. Chief Education Officer Olato Sam also addressed the team and expressed similar sentiments to that of the previous speakers. Sam shared his experiences from his first live baseball game at the Yankee Stadium which he said made him a life-long fan of the sport thereafter and urged the players to make the most of the opportunity. 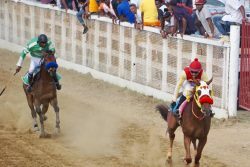 GBL President Robin Singh, said he was delighted to see the young ladies seizing the opportunity that presented itself. “Our organization has as a core principle, equality, the ladies put in the effort and deserve the chance to prove themselves internationally. “It has been a three year journey for some who began playing in school and are now furthering their education but they stuck with the sport and the sport is sticking with them,” he said. Singh disclosed that the team has already received an invitation to participate in the Phoenix Cup in Hong Kong in January 2016, adding that other organizations in the US have contacted the GBL to ascertain the team’s availability for tournaments in Chicago and Florida. 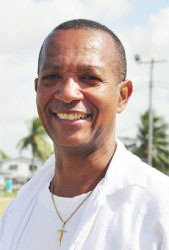 The team is in its final month of preparation for the competition, a series of games against the Berbice High School boys team, the Georgetown Bombers and the Junior Girls team are expected to have the squad sharp for the tournament.